In Yamaha’s line of digital pianos there are two similar categories – Portable Keyboards and Portable Grands. Many of these digital pianos share a lot of the same characteristics, but there are a few key elements that set them apart. Portable keyboards cater to a wider range of features and sounds, while the portable grands steer the user more towards a realistic piano experience. No matter which category one chooses, the consumer will be pleased with the product considering it is a Yamaha product. Below, please enjoy the interactive guide that was created to make your piano purchase easier. Compare the very affordable Yamaha YPG-235 to the best pianos in its class based on weight, price, and even customer reviews from Amazon.com. The YPG-235 is a piano that falls under the category of portable grands. It is at the lower end of the spectrum concerning manufacturing and cost, but in no way is it not a capable machine. It has proven itself to be durable, functional, and able to accommodate piano players at every level of expertise. No matter who you are, you will be able to enjoy this Yamaha digital piano. The YPG-235 is directly related to the YPG-535, and can even be considered a smaller version of it. Truthfully, when you set both pianos side by side, it is hard to tell much of a difference. 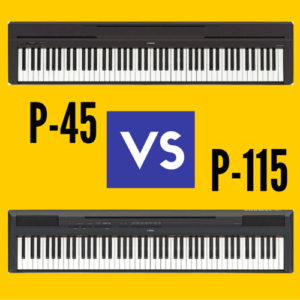 The only noticeable differences would be that the Yamaha YPG-535 has a full set of 88 keys, while the YPG-235 has only 76 keys. 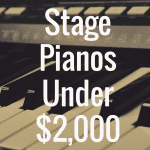 But those 76 keys are enough for most piano players and a great education step up for beginning players who are ready to graduate from beginner 61-key models. The YPG-235 will first strike you with its pretty design. It’s not overcomplicated with buttons, and its control interface does enough to help you navigate the piano with ease. Best of all, I like its unique color, which I’ve never seen before on a keyboard: champagne gold! It gives it a nice glossy finish and enhances the natural color of the speakers and the contrast of the black and white keys. The piano has a good size to it, having a compact length of just over forty six inches, and a width of sixteen inches. Its greatest feature is its weight, which comes in at 8.3 kilograms, or just over sixteen pounds. This weight is ideal for any musician who likes to travel and transport his instruments, and will make it easy for anyone wanting to place the keyboard in different places throughout the house. The 2-way Speaker System is one of the main features of the YPG-235. While other cheap pianos and keyboards are getting over on customers with sub-par sound accommodations, the 235 has two sets of separate woofers and tweeters that bring out the quality of the sounds contained on this piano. In addition to this is the Bass Boost System, which contains two ports on each speaker, adding a little bass if desired to everything you play. The retail version of this portable grand falters compared to the YPG-535 in that it doesn’t come with a stand, sustain pedal, and a power adapter. But that shouldn’t be a deterrent for anyone looking to buy. This is still available for under $260 online. In fact, in some bundles, you will find the World Tour Deluxe Padded Keyboard Bench, the Yamaha PA150 adapter, and the Yamaha HPE-150 Stereo Headphones. It’s a wonderful package for anyone looking to save on accessories, and the bundle will help you save over four hundred dollars on the list price. The keys of the YPG-235 have a nice touch to them, with a range of 76 black and white keys being supported by Yamaha’s Graded Soft Touch (GST) keyboard system. Yamaha has a number of different keyboard systems, from Graded Soft Touch (GST), to Graded Hammer Standard (GHS), Graded Hammer Effect (GHE), Graded Hammer 3rd Edition (GH3), and Natural Wood (NW). All of these keyboard systems feature a different level of manufacturing, with the highest end versions having realistic hammer effect systems that replicate a real piano. The YPG-235 does not have a hammer effect, but does have a responsive touch system contained in GST. The tones contained on all Yamaha products are always the highlight, and it’s not different with the 235. The Portable Grand piano sound is its trademark, and it is supported here by the tone generation of the AWM Stereo Sampling system, which effectively selects the correct grand piano sample dependent on how the player reacts to the keys. There’s also a convenient Portable Grand button which allows the player to immediately switch to that signature sound no matter what sound or rhythm is selected. There are over 500 additional sounds and voices to the portable grand, with 361 signature Yamaha XGlite voices. The user will have no problem finding a wonderful sound suitable to any situation. The YPG 235 also comes with Yamaha’s Y.E.S. v.6, which stands for the sixth generation of the Yamaha Education Suite. 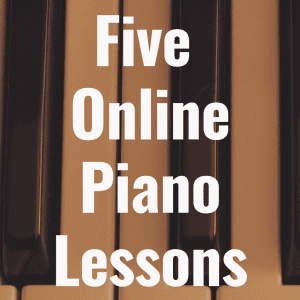 This feature is specifically designed to teach piano players at any level how to play the piano, with different capabilities such as keyboard lessons for each hand, lessons which grade your performance, and a full chord dictionary. The piano comes with 30 built-in songs that helps the player accomplish this, with over 70 more songs that come with the included CD-ROM. 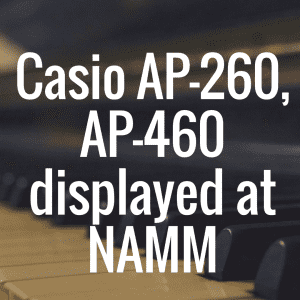 An aspiring piano player has plenty to work with when working with the 235. This digital keyboard also has the wonderful feature of a six-track recording system. This feature allows the piano player to piece together different layers of instruments and effects on six different tracks, which is great for young pianists trying to learn pieces or grade their own performance, and also for composers and music producers who want to learn how to put instruments together. The YPG 235 also has great connectivity with a handy USB port that allows for an easy connection to any kind of computer, allowing the piano player to bring external content into the machine. There is also an innovative new PC button which helps to avoid nasty menu trees and function selections. Being such a reliable machine, it’s impressive that it’s still available for under $250. 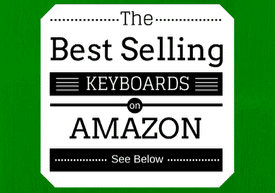 For additional reviews, please check back with Digital Piano Review Guide, as we roll out news and reviews on a regular basis. 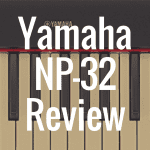 And if you enjoy Yamaha digital pianos, please click here for more piano reviews in this line. What Yamaha Digital Piano Is Best? What’s the Difference Between Digital Pianos and Keyboards? 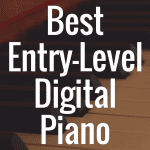 What’s the Best Entry-Level Digital Piano on the Market?